Don't try to use ingredients different from the above, or you will waste money and time. You can also pour less Martini dry and more gin, and you get an extra dry Martini cocktail. If you substitute gin with a good wodka then you get a Vodkatini. 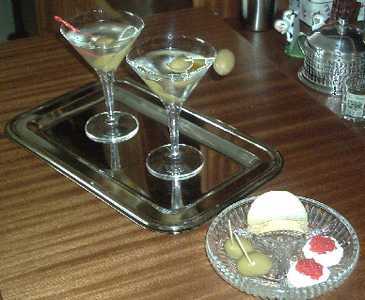 Despite the simple recipe, preparation of the Martini cocktail is laborious, and there are several different ways to get the cocktail done. First of all the glasses should be the classic thin cristal tapered Martini glasses. You should keep the glasses in the refrigerator at least one hour before serving the cocktail. Bartenders use to cool down the glasses putting some ice cubes into them and waiting several minutes. But this doesn't work much. Some people store the liqueurs (gin and Martini) into the refrigerator in order to get the cocktail as cold as possible when it is time to prepare. This is a good advise. The true recipe is the following: align one glass for each attending people. Put a fresh big green sweet olive with its toothpick into each glass. Squeeze a strip of lemon peel into each glass. Drop the squeezed peel into the glass. Then get the bottles out of the refrigerator and fill a sparkling clean mixer with 3 cl of gin and 1 cl of Martini for each attending people. Gently steer the liqueurs (use a plastic steerer, not a stainless steel one). Pour the liqueurs into the glasses and serve. You should be very quick since a warm Martini cocktail is worse than a headache. This original recipe has a couple of drawbacks: first of all the liquid warms up quickly, because Martini cocktail is essentially a hot & sunny day drink, and there is no ice to keep it cold. Secondly it is almost pure gin, and this can cause troubles to the average attendant. But there's a way to get a still drinkable Martini cocktail, without altering its own unique taste: simply add 3 or 4 ice cubes into each glass. This way you don't need to refrigerate the glasses nor the bottles. 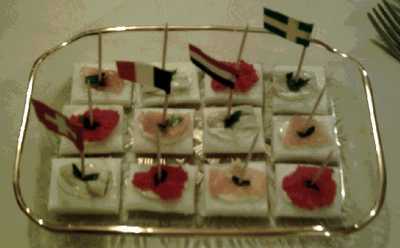 The ice cubes will keep the Martini cold for a long time, and will reduce the strength of the alchool. Decorating the Martini cocktail is not as easy as it seems. A regular toothpick inserted into the olive is usually too short to help you get the olive without wetting your fingers. So a practical workaround is to pinch two olives, one for each end of the toothpick, and to accomodate them with one olive out of the border of the glass. This will prevent the whole "apparate" from dropping under the level of the liquid. Or you can cut custom length toothpicks, if you can, from long bamboo barbecue spitfuls. Martini cocktail comes togheter with its appetizer, the olive inside the glass. But you can be serve additional green sweet olives, if you want, in a pleasant looking olive carrier. The olives should be fresh, with or without the kernel stone, each being equipped with a toothpick to avoid people picking them with their bare fingers. Peanuts and chips are also wellcome, provided they are integer and fresh. You can also use Pringles chips. You can also prepare some tartines with butter and anchovies.